December 3, 2018 By Lori Leave a Comment THIS POST MAY CONTAIN AFFILIATE LINKS. PLEASE READ MY DISCLOSURE HERE. Forgive the inevitable puns in this post but I just can’t help it. Makes me want to whoop it up. Whoops! I did it again. Whoopsie daisy! As I mentioned above, sometimes (many times) a recipe comes from what I have a taste for or it is inspired by something I tried elsewhere. But there are other times where I just think about something that I haven’t made before to the point that I can’t get it out of my head until I do just that- make it. That’s the case with these whoopie pies. I was feeling a little pressure because I needed Christmas Cookie #2 for the weekly series and knew I wanted it to be a chocolate recipe. Side note: if you need clarification as to why I wanted it to be chocolate, then maybe we should part ways. 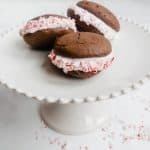 I’ve actually never made a whoopie pie so I did my research and adapted this recipe from a couple of sources. You might want to say I sandwiched a couple of recipes together and added my own twist. The cookie base is adapted from King Arthur Flour and the filling is a scaled down version of the marshmallow frosting used on the Magnolia Bakery Coconut Cake. I adore marshmallow and chocolate together and this filling is like a homemade version of Fluff. Can you use Fluff? 100%. However, once you make this filling and see how easy it comes together- especially because you don’t have to leave your house to shop for unusual ingredients- and you know what’s in it. Not to mention I consulted with my baking consultant, Leslie, and I got the thumbs up from her. Whoops! I almost forgot to mention about the crushed peppermint candy. This is what I bought at the store and was totally worth the price. It beats unwrapping candy canes and pounding them but I’ll leave that up to you. It’s a great stress reliever for sure. when both are used and the amount is equivalent, use unsweetened cocoa powder. 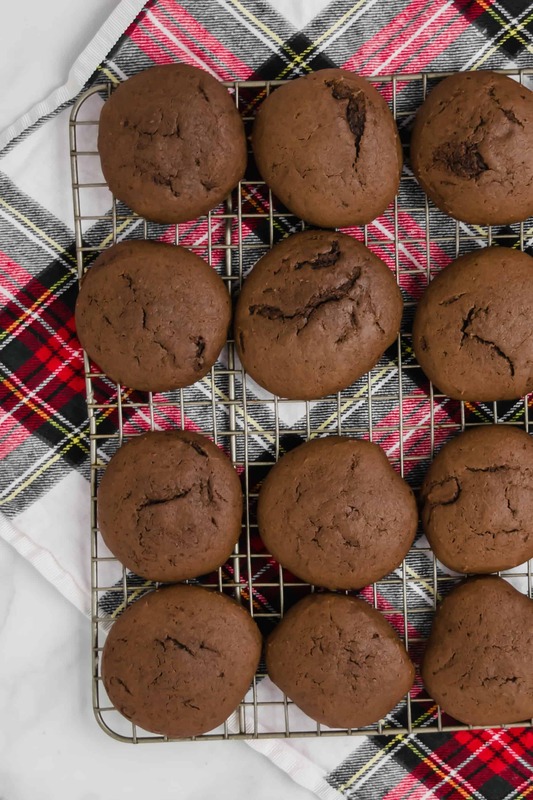 Alright – with the school stuff out of the way, the key to a good whoopie pie base is that it needs to be more of a dough and less of a batter because you don’t want the cookies to lose their shape while baking. This batter/dough is stickier and works well with a medium cookie scoop (shown here). While the cookies are baking, you can work on the filling. Here’s where the challenge presents itself. 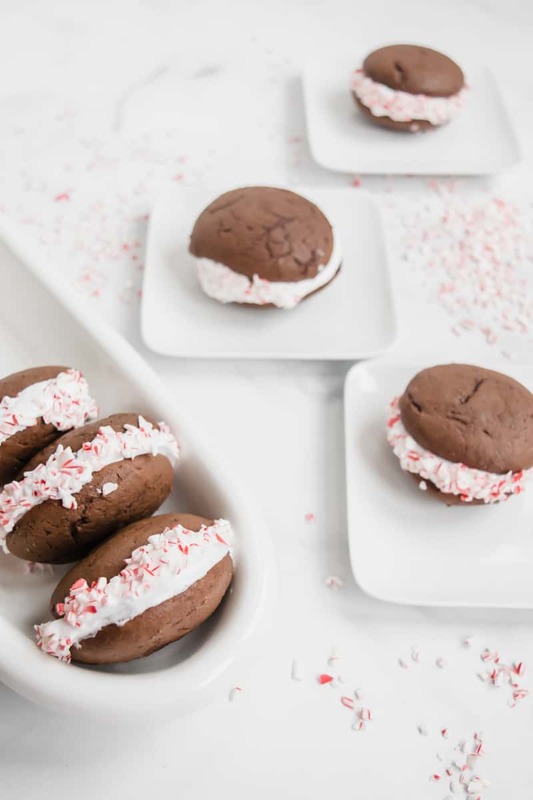 Most traditional whoopie pie recipes have a filling that contains shortening. I had a hard time making a filling with shortening that isn’t cooked. I know I eat that in prepared foods I’m sure all the time but I just can’t bring myself to add shortening to a filling and convince you to serve it. That being said, this marshmallow filling is softer and doesn’t have as much body so making these ahead isn’t ideal but boy, the flavor is there. Trade-offs, my friend, trade-offs. Make the cookies and freeze them if you want. Thaw the day you’re planning to serve them. Make the filling the day you are going to serve them. Earlier in the day is fine – you might have to whip it up a bit with a mixer. Fill them right before serving. Next, sit back and smile. Because you tried something different. And hey – the filling ideas are endless. Peanut butter, mocha, almond – whoopie! The dessert for when you want something a little more playful for the holidays. Preheat the oven to 350°. Line 2 baking sheets with parchment paper. In an electric mixer, beat together the butter, sugar, espresso powder if using, baking powder, baking soda, salt and vanilla until smooth. Clean the sides of the bowl with a spatula. Add the egg, beating and scraping the sides again. Add the cocoa and stir with a wooden spoon. Alternating with the milk, add the flour to the batter in 1/3 cup increments. Scrape down the sides of the bowl and mix again with mixer to soften and incorporate everything fully. 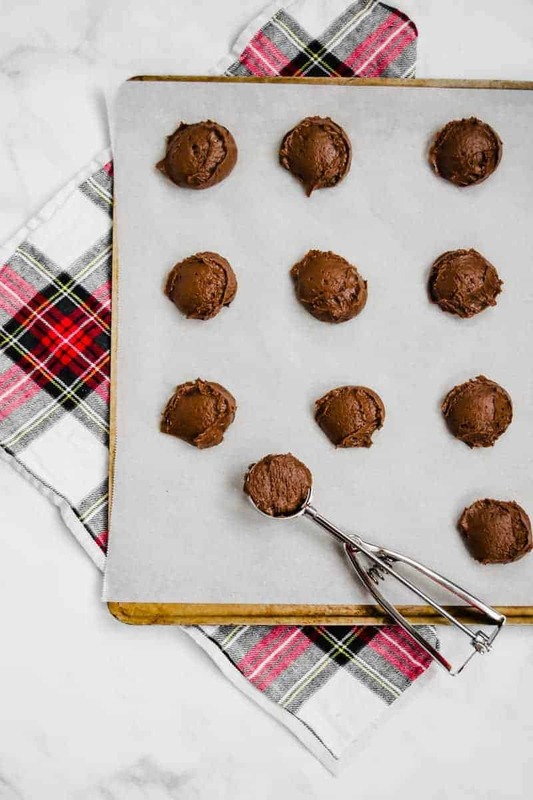 Using a medium sized cookie scoop or a 1/4 cup measure, drop the dough 3 across the cookie sheet so that you'll have enough room for them to spread. Bake for 9-10 minutes until the cookies are set and firm to the touch. Remove them from the oven and after 2-3 minutes, use a spatula to remove them to a wire rack to completely cool. Separate the white from the yolk reserving the yolk for another use. Place in medium mixing bowl. Add the vanilla to the egg white. With an electric mixer, mix egg white and vanilla until frothy about 1 minute. In a small saucepan over low heat, add the water, sugar and cream of tartar. Once the bubbles start to form on the edges, set a timer for 2-3 minutes. When then the timer is up, remove the pan from the stove and cool for about 10 minutes. With the mixer on medium high, slowly add the sugar water mixture in a steady stream to the egg whites and vanilla. Mix for approximately 5 minutes until stiff peaks are formed and the filling is glossy and thick. 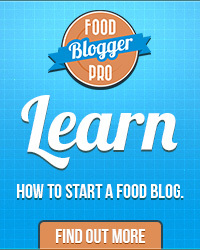 Using about 1-2 tablespoons of filling, top one side of a cookie and sandwich another one on top. 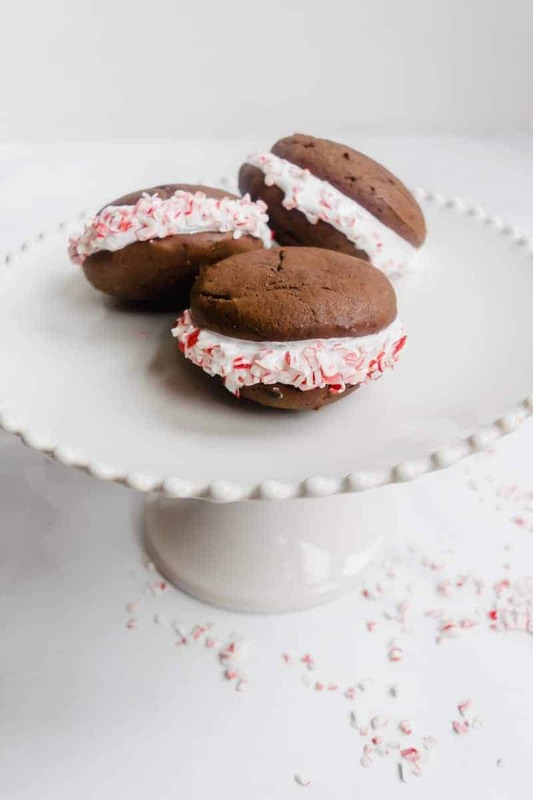 Pour crushed peppermint pieces on a plate and lightly roll the cookies edge in the peppermint. Let set on a cookie sheet. Can also be refrigerated for no more than an hour or two.